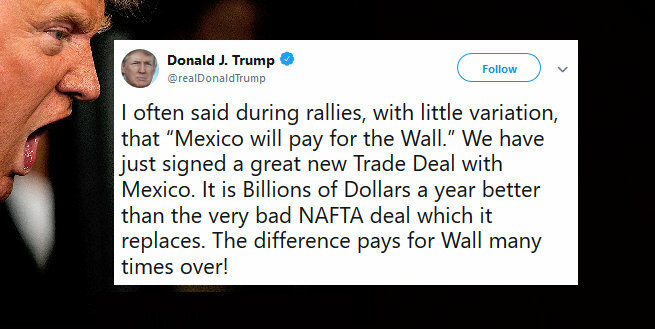 Trump: The USMCA Trade Deal Will Pay For The Wall - Joe.My.God. Throughout his campaign, Trump repeatedly vowed that America’s southern neighbor would stump up the money for the steel barrier. Between his announcement speech and the 2016 election, he declared 212 times that Mexico would pay for the wall, according to Factbase, which tracks all of Trump’s interviews, speeches and tweets. He then went on to argue that the wall would “pay for itself” within two months, due to the high cost of illegal immigration. Trade experts and economists have highlighted a number of problems with Trump’s argument. But in the last few months, the president has argued that Mexico would indirectly fund the structure through the new United States-Mexico-Canada Agreement (USMCA). The trade deal, which replaces NAFTA, has yet to be ratified by the legislative bodies in the US, Mexico and Canada. Democrats, who now control the House, have already voiced criticism of the deal and there is no guarantee that it will be approved. Even if it is rubber-stamped by lawmakers in all three countries, it wouldn’t come into effect until 2020 at the earliest.